Put your pig-tail light bulb aversions aside, because Philips has just won the DOE's $10 million L Prize Competition for the creation of a decidedly non-curlicue 60W equivalent LED lighting solution. The company was named the first winner in the 60W replacement bulb category at a Washington DC event, yesterday. It's taken three years to find a winner that could meet the high standards set forth by the DOE, specifically "ensuring that performance, quality, lifetime, cost, and availability meet expectations for widespread adoption and mass manufacturing." Requirements further stipulated that the 60W incandescent killer use less than 10 watts of power, and provide energy savings of 83 percent. If Americans replaced all of their 60W incandescents with Philips' little winner, the DOE estimates savings of $3.9 billion in a single year. 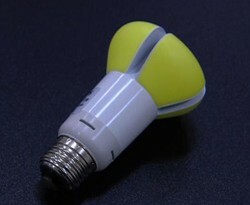 The bulb is expected to hit shelves as soon as early 2012. Full PR after the break. Philips wins DOE's $10 million L Prize for 60W incandescent killer originally appeared on Engadget on Thu, 04 Aug 2011 16:39:00 EDT. Please see our terms for use of feeds.